Multiplayer is still playable using Game Ranger. A preconfigured WINE wrapper for Linux is available. The soundtrack was available on the official website until the site was taken down. Mirrors are available on the unofficial fan site and Archive.org. 1.0 update adds an additional Multiplayer map, Hangar. Republic Commando Graphics Fix - Fixes some graphical issues, particularly bump mapping issues with modern graphics cards, and adds widescreen/4K support. Also adds in some graphical updates such as an adjustable FOV and the ability to see your own legs. For a vanilla-esque experience, use the Republic Commando Graphics fix v1.0 and Original HUD Texture, applying the files over the ones specified on the download page. 85° horizontal with Vert- behavior. 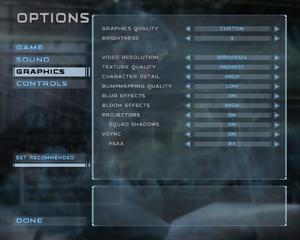 Use the Graphics Fix to add an FOV option to the menu, or see the WSGF entry to modify manually. Toggle with Alt+↵ Enter or use the -windowed command line argument. Start the game with the -windowed parameter and use Borderless Gaming. Up to 8x FSAA with Vsync enabled. Up to 8x SGSSAA can be forced with Nvidia Inspector. Change ; LevelOfAnisotropy=1 to LevelOfAnisotropy=16. 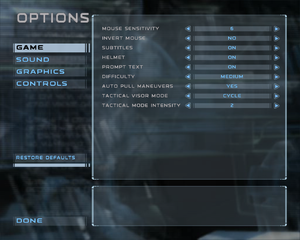 See Mouse sensitivity for how to set different sensitivity in the menus. Controller doesn't allow to navigate menus. Possible by editing <path-to-game>\GameData\Save\Profile_<user-id>\User.ini. Requires knowledge of Unreal config structure. See Controller sensitivity and axis inversion. Mouse sensitivity in menus is bound with sensitivity in game. 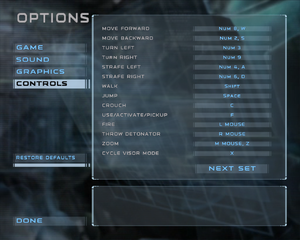 Because of that, navigating menus may become difficult, if a player sets high mouse sensitivity or has a high DPI mouse. Setting the game to a higher resolution may be able to help mitigate this. To disable mouse smoothing set MouseSmoothingMode to 0. To change the strength of mouse smoothing, change MouseSmoothingStrength using a value between 0.0 (weakest smoothing) and 1.0 (strongest). To change mouse acceleration, change MouseAccelThreshold using a value between 0 (no acceleration) and 100 (full acceleration). Change the value of MouseSensitivity= to the sensitivity you calculated. Change the values of both MouseYMultiplier= and MouseXMultiplier= to 0.4. If the menu sensitivity is still too high, then halve both mouse multipliers and double your sensitivity. This fix a profile to be already created already by the game. Open User (joystick).ini and copy all of its content. Open <path-to-game>\GameData\Save\Profile_<user-id>\User.ini remove its content and paste the content copied from User (joystick).ini in there. Copy the Dinput.dll, Dinput8.dll, XInput1_3.dll and XInputPlus.ini from XInput Plus Files folder (that you have extracted) and paste them in <path-to-game>\GameData\System. This guide is written for the Controller support fix and it may not work with custom bindings. Find a line JoyR=Axis aBaseX. Adjust the Speed value for your X-axis sensitivity. To invert the axis add type in a negative value (e.g. Speed=-690). Find a line JoyU=Axis aLookUp. Adjust the Speed value for your Y-axis sensitivity. To invert the axis add type in a negative value. May require setting UseDefaultDriver=False in <path-to-game>\System\System.ini. Assigns music to surround channels, which may cause issues with virtual surround setups. EAX 3. Set UseDefaultDriver=False in <path-to-game>\System\System.ini. For OpenAL Soft HRTF, follow this guide (requires UseDefaultDriver=False). This is a common problem, especially on ATI/AMD cards. Setting Bump mapping to Low should solve the problem. You can also start the game with a DirectX-8-to-9 emulator or install a fan made graphics fix to resolve the crashes. Intel HD Graphics are unaffected by this bug and can display the bumpmapped graphics natively. If you get an error message saying, "Failed to detect Steam", "Problem starting up Steam", or something similar, try restarting Steam. If that does not work, try deleting ClientRegistry.blob in the \Steam folder. 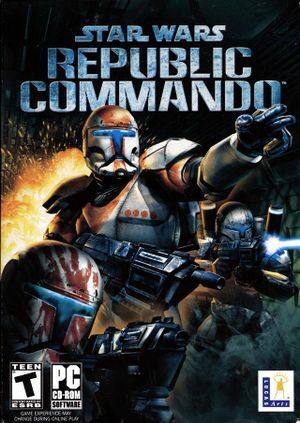 Right-click SWRepublicCommando.exe and go to the Compatibility tab of Properties. Tick the Run this program as an Administrator box, as well as the box for XP compatibility at the top, and apply the changes. This will correct the HUD for 16:9 resolutions. Download the Widescreen HUD Fix v1.3. Replace the original HUDTextures.utx with the fixed one. In Vista and Win7 (possibly later OS's as well) if the game refuses to set 3D Audio and EAX even with "UseDefaultDriver=False" and a checked OpenAL setup then install the custom "PAX" drivers for X-fi and other Creative audio cards. Make sure "UseDefaultDriver=False" is set in system.ini and latest OpenAL is installed. 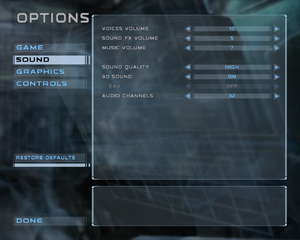 Now 3D Audio as well as EAX 3 and 32 channels should stay set in the options menu after game restart. Modified textures to represent the experience of an elite Arc Trooper, as well as 6 new maps interweaved into the main campaign. Modifies the B1 Battle Droid textures from their default grey to a tan that better represents their appearances in the movies and other media. ↑ 2.0 2.1 File/folder structure within this directory reflects the path(s) listed for Windows and/or Steam game data (use Wine regedit to access Windows registry paths). Games with Steam Cloud support may store data in ~/.steam/steam/userdata/<user-id>/6000/ in addition to or instead of this directory. The app ID (6000) may differ in some cases. Treat backslashes as forward slashes. See the glossary page for details. ↑ Verified by User:SirYodaJedi on August 2, 2018.